Uglyworld #1018 - Internets NOTspot (Project BIG - Image 76-365), originally uploaded by www.bazpics.com. 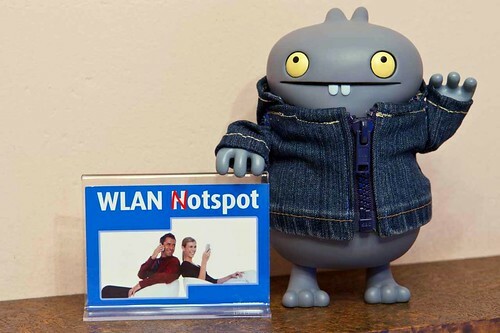 One thing that I just can't keeps my angers to myselfer is when we is travellings and staying in hotels that you often gets signs in the roomers that says they has a wireless internets hotspotter, when infacts I thinks it would be better calleds a NOTspot!!! Sometimes they wants enoughs cash for 1 single hours internets connection that could be usered to buys around 10 packetters of cookies, ten packetters!!! And then when you finallies pays a crazies sum and gets online you finds out that the connections speeder is so slows that you struggles to even gets the googler to load!!! Wakes up hotels owners arounds the world and sorts your internetters connections out! For nows I modifiered the sign in the currents room to helps the next guester out.